This is CME on ReachMD! The following activity, titled Eosinophilic Esophagitis: Nutritional Considerations in Pediatric Management is provided in partnership with Prova Education and supported by an educational grant from Abbott Nutrition. Before you begin this activity, be sure to review the faculty and commercial support disclosures, as well as the learning objectives. Your faculty is Dr. Vincent Mukkada. Hello, this is Vince Mukkada. I am an Associate Professor of Pediatrics and a pediatric gastroenterologist at Cincinnati Children’s Hospital and Medical Center in Cincinnati, Ohio, and a member of our Cincinnati Center for Eosinophilic Diseases team. So we’re going to start by summarizing the epidemiology and pathophysiology of eosinophilic esophagitis in children. We will then enumerate the potential triggers for eosinophilic esophagitis and then discuss how to plan and implement nutrition management of pediatric patients with eosinophilic esophagitis. To start, just a very brief review of some of what we know about pathophysiology. Eosinophilic is a chronic, immune-mediated or antigen-mediated esophageal disease, and this is defined by having symptoms related to esophageal dysfunction as well as eosinophilic-predominant inflammation noted on esophageal biopsies. Importantly, this is a clinical and histologic diagnosis, and so this is not something that can be made in isolation by a gastroenterologist or a pathologist. 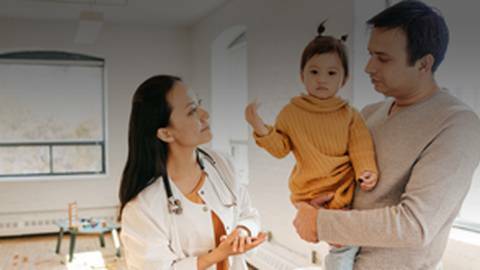 When a pediatrician or a primary care physician suspects eosinophilic esophagitis, this is a prompt to refer them to a gastroenterologist in order to do endoscopy for diagnosis. In terms of the symptoms, it is important to know that these can be different depending on the age of the patient, and so what we tend to see in younger children and infants is a little bit less specific, with signs of abdominal pain or fussiness, significant amounts of reflux that don’t seem to be responding to the typical therapies, vomiting sometimes to the point of causing difficulties with growth. One characteristic thing that we see a lot in babies as they are transitioning towards table food is feeding dysfunction, children with eosinophilic esophagitis frequently do well when they are breastfeeding or taking formula and are generally doing fine with smooth purees, but once they get to the level of stage 2 baby food where there starts to be solid chunks of food, they start to show clear signs for preferring liquids and smooth purees and start to push away the stage 2 and above baby foods, and that probably represents difficulty swallowing. As children get a little bit older, we continue to see vomiting and abdominal pain, and sometimes they can localize it more to describing chest pain or symptoms more like heartburn in adults, but then as the children become young adolescents or young adults, we see less of the abdominal pain and vomiting and much more difficulty swallowing, sometimes progressing to the point of having an actual food impaction where food is getting stuck and needing to be removed endoscopically. Generally speaking, we believe that most patients with eosinophilic esophagitis have food antigen-driven disease. There are at least some small number of patients who have environmental allergens, we have been looking for risk factors for the development of eosinophilic esophagitis, including birth by Caesarean section, premature delivery, early antibiotic exposure during infancy. There is a questionable effect of breastfeeding in terms of being protective against eosinophilic esophagitis. And there’s been some suspicion that acid suppression early in life may also predispose patients. We also tend to see this predominantly in males. one possible therapy for esophageal eosinophilia has been the use of proton pump inhibitors. we had believed that this was due to the acid-combating effects of these drugs. More recent data has suggested that the proton pump inhibitors may have a direct anti-inflammatory effect on eosinophils. And these seem to work in a minority, but probably 25% to 30% of patients as a sole therapy agent. The other typical medical management for this is the use of swallowed topical steroids and these drugs work somewhere in the range of about 60% to 80% of patients. We are going to focus today on dietary management, in the attempt to be able to manage this disease without the use of medications. Initially, we had all really focused on using allergy tests to identify food allergies, both IgE-mediated food allergies or immediate food allergies as well as delayed hypersensitivity reactions, and then remove these foods and see if this is sufficient to control the esophageal inflammation. these approaches have not been successful and we don’t necessarily have allergy tests that accurately predict which foods are truly the causative antigens in this disease. we’ve moved towards empiric elimination diets where we remove foods that we have come to recognize as being common food antigen triggers for eosinophilic esophagitis. The most common form is called a 6-food elimination diet where we eliminate the top 6 food allergens, which are milk, wheat, egg, soy, fish and shellfish, and peanuts and tree nuts. This generally works in somewhere around 70% to 75% of patients. The issue with this is that most patients are truly only reacting to 1 to 3 of these antigens, and so there is a long process of adding foods back in with subsequent endoscopies in order to identify the minimally restrictive diet that still controls their inflammation. there has been a lot of work looking at less restrictive diets to manage the disease without as many eliminations. One approach has been to eliminate solely milk, and this seems to work in about 40% of patients. there has been some recent work done by a group in Spain where they did a combination of a 2-food elimination And the study showed that this reduced the number of endoscopic procedures and tended to reduce the time that this all took by about 20%, and by doing this, the thought was that we would reduce unnecessary dietary eliminations. In addition to these approaches, especially if we have tried other dietary management that has failed, the ultimate diet intervention is to move to an exclusive elemental diet, meaning that we remove all food antigens and the patients only consume an elemental formula, based on amino acids, for a period of about 3 months with a plan to repeat an endoscopy at the end. Following that, then there is a long process of adding back food antigens to see if we can build an acceptable diet that continues to control their inflammation. This approach is effective in controlling esophageal inflammation in up to 95% of patients, so it is our most effective treatment in terms of histology. There are some significant potential downsides with this in terms of the need for many, endoscopies in order to rebuild a diet, as well as the fact that the elemental formulas, because of the volume needed, this approach frequently requires the use of enteral tubes, either a G tube or an NG tube. in order to implement effective nutritional management, we need to focus very carefully on the patients’ overall nutritional status and make sure that we are not overly restricting them or removing any important micro or macro nutrients. We try to focus very carefully on balancing the need to control their inflammation with the patients’ quality of life so that we are not controlling their esophageal inflammation at the expense of their enjoyment, and we do need to be aware and monitor for issues with feeding aversion, especially in our younger patients. With all of this being said, adherence to these diets can be quite difficult, and so there has been some data that about a third of pediatric patients will become nonadherent to their diet over time. We have to tell people that you need to be absolute in terms of maintaining complete avoidance of the identified food antigens. So I did want to comment a little bit on the role of different healthcare providers. primary care providers are really on the front line of identifying patients with concerning symptoms, there should be a very low threshold to referring to a specialist for further evaluation. From an ongoing management perspective, I’m very fortunate that I work in a close, multidisciplinary, collaborative treatment center, and our management here involves both gastroenterology as well as allergy. We work very closely with our dietitians, both to help us with doing an initial assessment of their growth we tend to do assessment of bone density at diagnosis, and then helping us to identify an appropriate dietary regimen the dietitian has an enormous role in terms of not only educating the family on what foods they need to avoid but also potentially to provide some alternative options so that families might have something to turn to—for instance, when they eliminate milk, to try to identify potential substitute. We have a psychologist who has been working with us thinking about some of the social and emotional costs that are involved in being on a restricted diet or the need for repeated procedures and time away from work or school, as well as helping with coping with any symptoms that might still occur. We also have the benefit of having social work support for helping with addressing paperwork needs and navigating the healthcare system, insurance issues and the like. This can be an expensive disease and require a lot of time off work and school in order to achieve remission, and so the involvement of a whole village of people can really help to generate the best outcome. Our primary care provider partners are seeing these patients more often than we do and having a good sense of not just how the patient is doing and how in terms of compliance with their medications or diet, but also how this is affecting the patient and the family as a whole, and so we attempt to keep very good communication. To receive your free CME credit, be sure to complete the post-test and evaluation by visiting ReachMD.com/Prova. This is CME on ReachMD: Be Part of the Knowledge. Review what’s involved in the management of pediatric eosinophilic esophagitis, including triggers to look out for and implementing a dietary plan. Eosinophilic esophagitis is a chronic, immune-mediated or antigen-mediated disease, and since it requires a clinical and histologic diagnosis, a team of healthcare professionals is needed—from a pediatrician or primary care doctor to a pathologist or gastroenterologist. But diagnosis is only the first step. Here to recap the essential elements of a pediatric eosinophilic esophagitis management plan is Dr. Vincent Mukkada. Ann Early Wiehn has nothing to disclose. Summarize the epidemiology and pathophysiology of eosinophilic esophagitis in children. Review the clinical presentation and symptoms for eosinophilic esophagitis in pediatric patients. Plan and implement nutrition management of pediatric patients with eosinophilic esophagitis. This activity is designed to meet the educational needs of pediatricians, pediatric gastroenterologists, allergists/immunologists, dieticians,and other members of the interprofessional team who are involved in the management of pediatric patients with eosinophilic esophagitis. This activity is supported by an independent educational grant from Abbott Nutrition.